Are you looking to Learn a new Craft Skill this year? Why not try knitting! Knitting is one of the most relaxing hobbies which you can pick up and take with you anywhere. There is a fabulous selection of Knitting Patterns and Knitting Yarns to choose from nowadays which makes this a really inspiring and exciting craft to learn. You can knit for youself, your family and friends, for around the home and even your pets! All you will need to start is a pair of knitting needles and a ball of yarn. We recommend 4mm Knitting Needles and DK Yarn (double knitting). As with many crafts practice makes perfect. You will probably need to keep repeating the basic stitches over and over until you learn a good tension and your stitches all look nice and neat. Practicing is all part of the fun! We all started somewhere so don't be put off if you struggle a bit at first. Before we begin, a little information on knitting stitches; All knitting patterns are made up of 2 basic knitting stitches, 'knit' and 'purl'. Once you have mastered these you have got the tools you need to knit practically any knitting pattern. To begin you will also need to know how to 'cast on'. This creates the first row of knitting for you and basically gets the yarn on your knitting needles ready for you to begin. When you get to the end, you will also need to know how to 'cast off'. Make a loop as in diagram leaving an end of yarn to form a tail. (As a rough guide the tail will need to be 3 or 4 times longer than the finished width of the knitting). Pull ball end of yarn through loop with point of needle making a 2nd loop. Pull 2nd loop through first loop onto knitting needle and hold needle under right arm. Holding 1 end of yarn in each hand pull yarn ends down and apart to tighten loop. This slip knot counts as the first stitch of the cast on row. Hold needle firmly under right arm and put slip knot which has become 1st stitch onto this needle holding tail in left hand. Hold ball end of yarn in right hand. Make a loop round left thumb with tail and push needle upwards into loop. Wind ball end of yarn over point of needle with right hand. Pull yarn through with needle to make second stitch. Pull gently on tail to tighten stitch. Repeat until you have enough stitches. Congratulations! You can now cast on! Keep practicing this technique until all your stitches look neat and even. If you make a mistake dont worry, just pull your stitches back and start again. Next we will move onto the 'Knit' stitch. First of all make sure you have cast on a few stitches (at least 10) so you have a good amount of stitches to practice with. Hold needle with cast on stitches in left hand and empty needle under right arm as for cast on. The tail of yarn will be under the first stitch on a right side row. 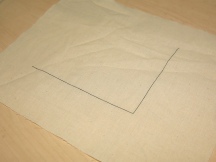 Push right hand needle through 1st stitch. Wind ball end of yarn under then over right hand needle. Pull yarn through to make a loop. Keeping loop (which will now be the new stitch) on right hand needle, drop old stitch off left hand needle. Repeat until there are no more stitches on left hand needle. (You have just completed a row). Swap needles so that empty needle is in right hand again to start next row. Once again keep practicing this technique for as long as you need to until you feel confident and you when you can see your stitches are becoming neat and tidy. Try to ensure your stitches are the same tension (so they all look they same). Once you have mastered this you can officially Knit! With yarn at front of work push right hand needle through 1st stitch from back towards front and from right to left. Wind ball end of yarn over and round right hand needle and pull yarn through to make a loop. Keeping loop (which will be the new stitch) on right hand needle, drop old stitch off left hand needle. Repeat until there are no more stitches on left hand needle. Now you deserve a big pat on the back because youv'e mastered the Purl stitch! Well done! All we have left to show you in covering the basics now is how to 'Cast Off'. This will finish off your piece of knitting and take it off the needles whilst securing the last row of stitches. Knit first 2 stitches from left hand needle then use point of left hand needle to pick up first stitch and pull it over second stitch and off right hand needle. Knit next stitch and pass last stitch over. Repeat to end of row. (You will have only 1 stitch on right hand needle to end of row). When all stitches have been worked, cut yarn and pull end through last stitch pulling tightly to finish off. And thats all the basics covered! Well done for getting this far! Know you know how to cast on, knit, purl and cast off. It is a good idea to practice these skills in your first project. We receommend starting off with something simple like a scarf or snood. When you move onto other more complicated patterns, you will need to know how to increase and decrease your stitches. This what creates shaped pieces, for example the shape of an armhole or the shaping at the waist of a garment. Again its easy to do when you know how, so let us help you with some more step by step guides! Insert right hand needle from left to right into front of both stitches at same time. Wrap yarn round right hand needle and complete as if knitting 1 stitch. Let 2 stitches that have been worked together slip off needle at same time. Work a knit stitch as normal into the next stitch but instead of dropping the old stitch off the left hand needle, insert the right hand needle into the back of the old stitch and work to form another knit stitch from it, then drop the old stitch off the left hand needle as usual. And its as easy as that! Work a purl stitch as normal into the next stitch, but instead of dropping the old stitch off the left hand needle, insert the right hand needle into the back of the old stitch and make another purl stitch from it, then drop the old stitch off the left hand needle as usual. (This may feel awkward to do, but will become easier with practise). And again it is as easy as that! Now you know how to create shaping in your garments and other knitted projects. If you are looking to do multicoloured knitting, you will need to know how to change the colour of yarn half way through your knitting. To do this, you should always start a new ball of yarn at the beginning of a row so that you can sew in the ends neatly. Start the next row using new yarn. When you have worked a few stitches tie the ends together leaving enough yarn to sew in. Another tip is to sew coloured 'marker threads' into your knitting. 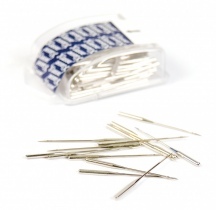 These act as pointers to help you sew your knitted pieces together accurately and neatly. To do this, thread a short piece of yarn of a different colour through the first and last stitches on the needle and knot loosely in place. If you need more than 1 set of marker threads it is a good idea to use different coloured scraps of yarn so that you can match them up easily. These can be cut off when you have finished. When you have completed your knitting, next you will need to know how to sew all those pieces together to create your finished garment or object. 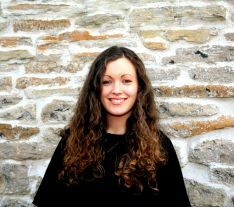 It is very easy to spoil the look of your knitting if you dont know how to professionally stitch your pieces together. So we are here to help! Pin knitted pieces together with right sides facing and matching up ends of rows. Start at right hand edge using either a tail end of yarn or a matching piece of yarn and make 2 stitches at edge to hold firmly. With yarn at front make a stitch through both pieces of knitting about 0.5cm to the left. Bring yarn to front of work by pushing needle through from back 0.5cm to the left and make 2nd stitch by pushing needle to back of work next to end of last stitch. Repeat to left hand edge and fasten off securely with 2 stitches close to edge. With the right side of the work facing up, lay down the pieces to be joined, flat and edge to edge. Working from the front and half a stitch in from the edge on each piece, insert the needle from the front through the centre of the stitch sliding it under two rows as shown. Cross to the opposite piece of work and slide the needle under two rows at a time. Work from piece to piece in this way sliding the needle under 2 rows at a time, alternating from one to the other piece until the seam is complete. Make sure that you don’t miss any rows and that the pieces match all the way up. If you are working a vertical seam in garter stitch or moss stitch take a full stitch from each piece, rather than half stitches. You will need to sew in the ends of yarn at the beginning and end of a piece of knitting and where new balls or colours have been joined in. Sew end through every other edge stitch. We are almost at the end now, but first we have 4 more little techinques to share with you! These are decorative techniques to show you how to add your own individual style to your creations. Sew on button. Use pins or coloured threads to mark where loop needs to be placed. Pull yarn through edge of knitting at one marked point leaving a short end. 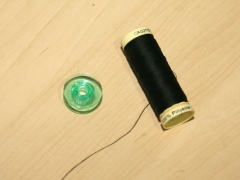 Make a loop of thread wide enough to go over button. Pull thread through at other mark. Repeat to make 4 strands. Stitch over all strands and loose end drawing needle point in between loops and needle thread. Fasten off at other side of loop. Next up, how to make a PomPom! Pompoms are perfect for adding a pop of fun to your knitting projects - sew them to the top of hats, the corners of cushions, along the edge of a throw to make a pompom trimming...the possibilities are endless! Cut 2 cardboard circles the same size as the pompom and cut a hole in the middle of each. (Alternatively, you can use one of our pompom makers). Put the 2 pieces of card together and wrap yarn around until the hole is full. Cut around the edge a few layers of yarn at a time until you reach the card. Make sure every strand of yarn is cut. Pull the cards slightly apart and wrap a length of yarn around the middle to secure the strands. Tie a knot and leave the long ends for attaching pompoms. Take card off and trim pompom with scissors. Cut several strands of yarn 3 times longer than needed. e.g. If your cord is to be 60cm long you will need strands 180cm long. Knot the strands together at each end and insert a pencil through one end. Pin down the other end securely. Keeping the yarn full length and taut, twist the pencil until the yarn is tightly twisted and kinks when the tension is relaxed. Fold yarn in half keeping it taut to avoid tangling and remove pencil. Make a knot at both ends leaving extra yarn to make tassels. Cut 3 strands of yarn 11?2 times longer than required finished length. e.g. For a 10cm plait you will need to cut the strands 15cm long. Knot the strands together at one end and secure this end with a pin to hold plait firmly as you work. Take left strand A to the middle over the middle strand, then take right strand C over the middle strand. Continue moving the left and right strands over the middle strand until the plait is long enough. Tie a knot to secure end. And there we have it! If you mastered these techniques you can now say you have learnt to knit...well done! We hope this little guide has been helpful to those looking to learn to knit, or if you looking to improve and add to your knitting skills. As ever, if you need some help with your knitting, please leave us a comment and our team of knitters here at Minerva will do our best to help!